If you are a music lover or if you love to watch movies sitting back in your couch in your little room, then these Logitech Z313 speakers will surely add the much required effect. This 2.1 system is a power-packed speaker, which has got numerous features in a single package. This speaker has been designed basically for music reproduction and is more than capable of supporting the fairly limited sonic range of any typical movie track. With an apt design and build these speakers have been rudimental in appeasing many customers. Here, is the Logitech z313 review which might be quite handy for you in deciding whether or not to buy these speakers. 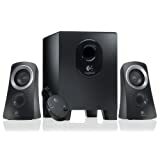 The Logitech Z313 speakers are decked with a number of features, the prominent of them being a wired control pad. There are times when you would want soft music to play in the background and at times you might want to simply notch them up. These are the moments when the control pad comes in handy that even have an audio jack where you can plug in your headphones. The output power of the total system is around 25 Watts RMS and that is just enough to fill your entire room or office. The subwoofer is a compact box that does not demand a huge space. Moreover it is powered with resonant and rich bass that makes your time worth being around them. The frequency response of the system varies in the range from 48 Hertz to 20 K-Hertz which is more than what can be expected from a 2.1 system. • The most significant upper hand of these speakers is the attractive design and build. The speaker has matte body which is plastic made and the round edges add the right curve to its look. • The satellites provided with the speakers do not take much space and are angled upwards in order to channel the music towards the listener. • The wired remote or control pad available with the speaker system is a thumbs up, for it has a built-in audio jack in which the listener can at any moment plug in his headphones and listen his music in privacy. • The sound quality is exceptional which becomes moving enough when the subwoofer comes into play. The subwoofer gives the bass-oriented edge of the music without any distortions. The cons are really imperceptible because the speakers have got it all. • The customers usually complain of the cables being short or being fixed to the subwoofer which sometimes makes it difficult to move them. • Some customers complain of the connecting cables being too long which in all can be neglected. • Slight distortions can be sighted at very high volumes which can be minimized by switching off the subwoofer. Final Verdict – Why you should go for these speakers? The speakers are simply extraordinary for the price range it is available in. They are best suited for general uses to be fitted to your desktops in your room or your office. Moreover the design of the speakers is very attractive that you would not like to hide them and they do not even occupy much space. After having read about the Logitech Z313 speaker system, if you are convinced for purchasing them, then do not sit back and relax on your couch, rather make the right click and invest in this great buy. Here is some other good choices.